Some days I get inspired by what I watch on TV and I’d always try to re-create my own version with personal favourites or family favourite. What I do is take with me the tips & tricks to apply to what I understand about flavours, scents, and how they marry with my chosen ingredients. This recipe has been something I have been dying to try for the longest time as it is healthy yet fulfilling! Yes, as a simple disclaimer, I’m not big on fancy plating so don’t mind my pictures! 2. In a mixing bowl, combine the Breadcrumbs, Butter, Parmesan, Herbs and Pepper. I used my hand to mix it as it helps melt the butter, wear a glove if you worry about the grease. Taste a little to see what is lacking and adjust according to your preference. 3. Lay out your flatten chicken and generously cover the side facing you with the mix. Roll up the chicken and use toothpicks to secure the chicken. How much mix you can stuff into the chicken will determine how moist and tasty the chicken will become. The mix will fall out but don’t worry. You can gather what has fallen out to reuse them. Do the same for the next 3. 4. Place the four rolls of chicken on the baking tray and cover it with the remaining mix and all else that fell out. And tada! 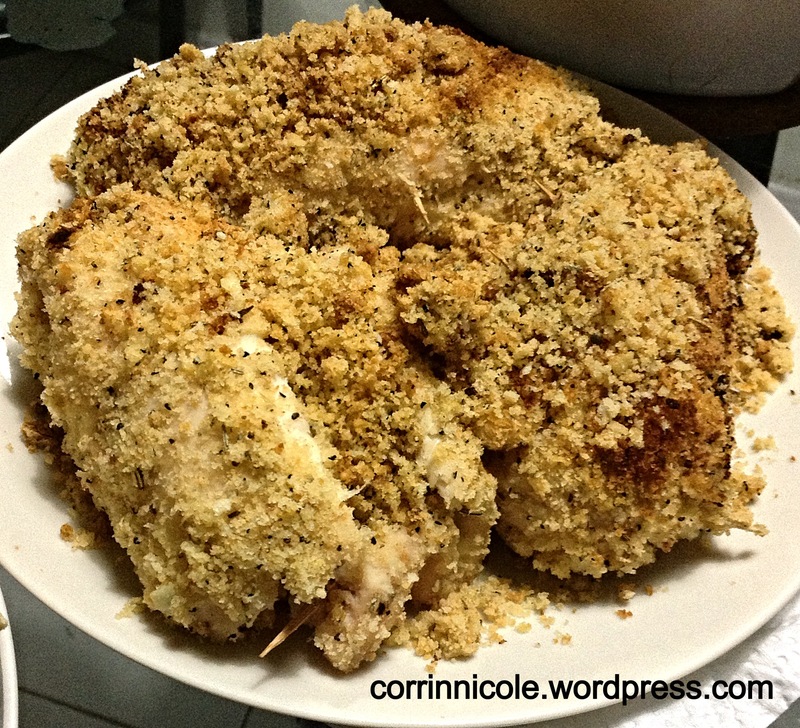 You should get a golden brown shade from the crumbs while your chicken is cooked through – and because smell is so important to me, that combination of butter, parmesan and herbs cooking will start to fill the kitchen and get your tummy working. Hope you have fun too!